John T. Godfrey 4th FG Triple Ace USAAF, WWII. 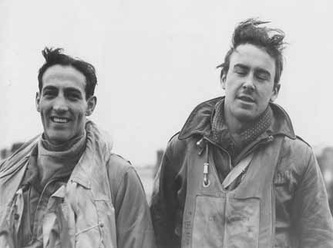 4th Fighter Group ace Johnny Godfrey of 336 Squadron. Famed 4th Fighter group ace Lt Johnny Godfrey swoops past the second of three Germans he shot on 22 April 1944. This Mustang, a P-51B-10NA, Godfrey's personal mount for only five days was named Reggie's Reply in memory of his brother who was lost when his ship was torpedoed by a Nazi Sub in February 1941. Godfrey's victims were most likely from III./JG 1 which lost eight Me 109s in the vicinity of Kassel where he scored his kills that day. John Trevor Godfrey was born in Canada on March 28, 1922 but was raised in Woonsocket, Rhode Island. After graduation from high school in 1941, Godfrey went north to Canada and made several attempts to join the RCAF but his mother notified the FBI and he was arrested twice for violation of the Neutrality Act. Finally his parents agreed to let him go and he joined the RCAF in August 1940. He graduated from flight school in October 1942. Upon arriving in England he was posted to No 57 Operational Training Unit. He remained with the RCAF until joining the USAAF in April 1943. 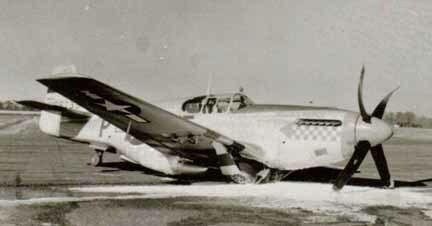 After transitioning to the P-47 he arrived in Debden, England and was posted to the 4th Fighter Group on 22 September 1943. By coincidence on the same day, another famous ace, Ralph Kidd Hofer arrived in Debden. Johnny was assigned to 336 Squadron while Hofer went to 334 Squadron. Johnny scored his first victories while flying P-47 Thunderbolts in December 1943. He would not be successful in aerial combat again until after the group transitioned to the P-51 Mustang in March 1944. By the end of the month he was a double ace with 10 victories. He scored 3.5 victories during the first week of April before taking a well deserved week of for R&R. 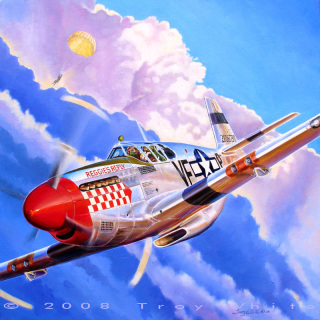 When he returned he was assigned a shiny new B model Mustang which is depicted in the above painting. Godfrey flew "Reggie's Reply" for the first time on 21 April. The following day was the mission to Kassel which would be his most successful combat of the war. 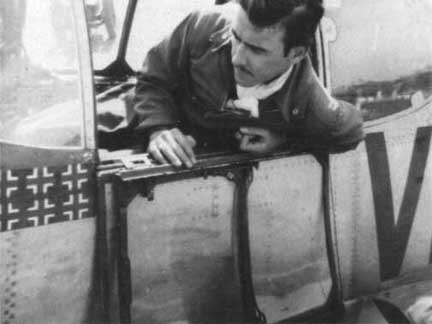 On the 24th he shot down an FW 190 and damaged a second for his last victories in this particular aircraft. Two days later 42-106730 was badly damaged on takeoff when the main wheels retracted before pilot, Lt. Bob Tussey had enough speed to rotate. Godfrey Scored another victory on 1 May before he went back to the US at the end of his first tour. He returned in July and scored two more victories before being accidently shot down by his wingman near Nordhausen Germany on 24 August 1944. 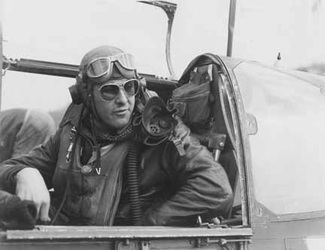 Godfrey's 16.33 air and 12.66 ground victories place him at the top of the 4th Fighter Group's list of aces in a three way tie with Kidd Hofer and Jim Goodson. He was awarded the Silver Star with Oak Leaf Cluster, the Distinguished Flying Cross with five Oak Leaf Clusters and the Air Medal with three Oak Leaf Clusters. Johnny died on June 12, 1958 of Lou Gehrig's Disease.